I've occasionally had people ask how I manage to get so much done - how I read so much while also working full time, doing uni part time and working on various side projects like this blog or Flatcook, a startup I'm cofounding. The core of my ability to do this is a system called 'Getting Things Done', originally outlined in a book called, aptly enough, Getting Things Done: The Art of Stress-Free Productivity . GTD is a system essentially for organising all the work you have yet to do, all the projects you're working on, how to process the mountain of work most people take onto themselves, and make best use of your time. The idea is simple; any time you think of something you might need to do, write it down. No matter what, or where, or how big or small, write it down and chuck it in your inbox (Some list or repository that is easily accessible for taking notes - I suggest the Trello Android/iOS app in this guide). The reason for this is that if you always write things down immediately, you can trust you've never forgotten anything. Any thing that you might need to do, you can trust your past self has filed it in your system and will come back to it later. It sounds almost deceptively simple, but the psychology's very elegant. If you only write down some things some of the time, or even 99% of the time, there's always a part of your brain wondering what else you might have forgotten to do. Have you ever thought you needed to do something, then found it popping into your head repeatedly over the day, even though you couldn't do anything about it yet? It's a useful feature of your subconscious because it helps you remember things, by repeatedly reminding you of them. However it can be an annoying distraction and take up cognitive space. The more things you're trying to remember at once, the more mental energy it can take up trying to remember and juggle them all. However, if you write down 100% of the things you need to do as soon as you think of them, your mind can rest easy. By trusting in your system to organize all your outstanding to-dos, you wont be continually reminded of them by your subconscious. By collecting everything as it comes in, you take uncertainty about how many tasks you have remembered to do and turn it into certainty that becomes confidence. Another type of uncertainty comes in around what a task involves. You probably have something on your todo list like 'Organise dinner'. But that isn't really an action you can do, you dont sit down, do 'organising dinner' for an hour, and then you're finished. There is still some uncertainty in the task. 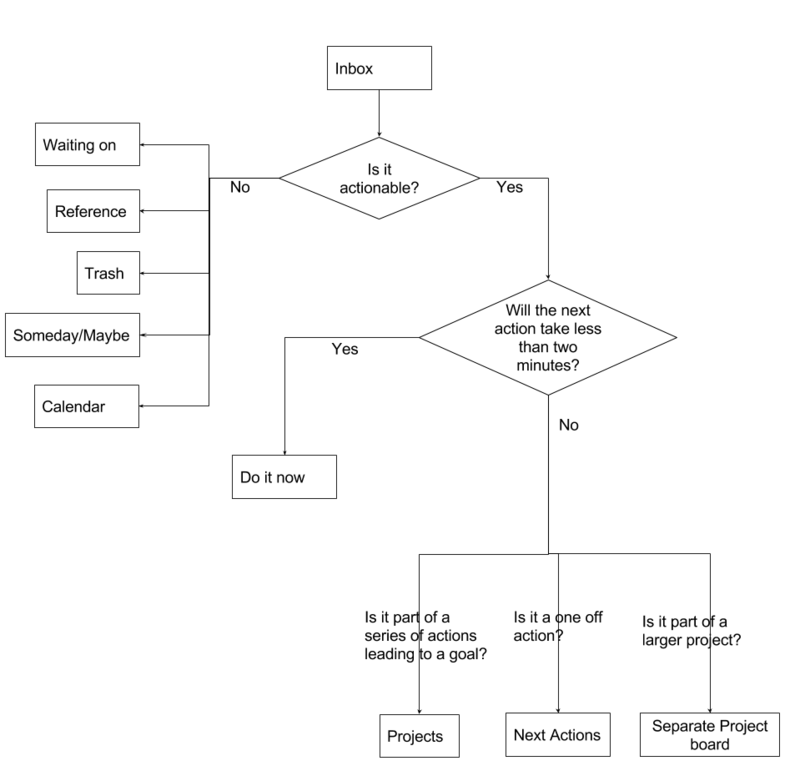 GTD involves making sure that every project on your todo list has a next action on it, working backwards from the goal until you figure out what the next thing is to do. Continuing the example above, organising dinner might make you think 'well i guess I have to make a facebook event... but in order to make that I need to lock in the time and place... So I guess the next thing I have to do is call the restaurant and make a booking'. Now your todo 'organise a party' has a concrete action 'call restaurant' next to it. By doing this exercise for each and every item in your system, you end up with a list of concrete actions that need to be done. The power of this is that instead of a vague feeling of time on each task, you know that to move it along that little bit towards completion will only take a five minute phone call. You can slot that phone call in anywhere during the day - I'm sure you have ten minutes free somewhere, between meetings or waiting for the bus that you can fit it in. You can also group together all the tasks that are phone calls and knock them off in one go, or group together all the tasks that involve purchasing something and do them all at once when you're at the shops. Defining a next action decreases that invisible stress you get from unknowns and enables you to prioritize more effectively. So there are a few other things to know about how this system works. Like I mentioned above, collect everything that pops into your head over the course of the day. You can just make notes in an app on your phone, or I suggest putting them straight into an 'Inbox' list in Trello, see the Trello section for more. Waiting on - They will be actionable, but aren't yet because you're waiting on someone or something to get back to you. These go into the 'Waiting on' category, which if you follow my template is a list in Trello. Calendar - They will be actionable, but aren't until a certain date. These go on your calendar for that date or time. Reference - Reference material, such as lists of recipes, articles or anything you might want to some day look up. These go into Evernote in my system in order to be easily accessible and searchable from anywhere. Someday/Maybe - A list in Trello to hold all the items you might want to someday start work on but not yet. Things like learn a language, sign up for a course that doesn't start yet, or buy something when you've got the money. Trash - If it doesn't fit into the above categories, do you really need to keep it? Chuck it in the bin/delete it. If it takes less than two minutes, just do it right then and there. This is one of the hidden huge benefits of this system - just addressing all the tiny items that take a second to do gives a huge psychological energy boost because of a succession of quick wins. The good feeling you get from knocking off several items in quick succession is usually enough fuel to tackle some of the more complex tasks on your backlog. Next Actions - If it is a standalone task that won't have any more work to do because of its completion then it goes straight into next actions. When all these steps are complete, dinner will be organised and that will be the end of everything you need to do - besides 'Show up' which might go on your calendar! The next open item on your checklist gets made into ts own card and goes on the Next Actions list. Large Projects - On the other hand, some projects will consist of multiple goals, some of which can be worked on in parallel, some of which are dependent on each other. For example, a 'Renovate the house' project might contain goals such as 'Replace sink in kitchen' and 'add bath to bathroom' that can be worked on in parallel as they don't rely on each other. On the other hand, something like 'Get electrician in to wire up house' might be dependent on things in both the kitchen and bathroom to be complete before you can call the electrician in. These large projects I separate out into an entirely separate board in Trello, and track all of the related things on that board. Things like work, a side project, or a blog might all have enough different and interconnected tasks that they warrant a board of their own. So that's the bones of the process, how does that actually translate into making your life more productive? Here's what it looks like to incorporate in your daily routine. Collect - Any time anything pops into your head that you need to do, you whip out the Trello app and chuck a new card in the 'Inbox' list. Process - Once per day you take 15 minutes or so to process the inbox. For me this is the first thing I do after work each day, maybe you could get it done on the commute home or before leaving work. Plan - At the start of each day you review your calendar and make sure you know all your appointments for the day, and anything that needs to get done on that day that you previously filed on your calendar. Do - Any time you get discretionary time to work on things, you consult the Next Actions list and choose something to do based on context and priorities. For example if you are at work, you would consult the list on your board for work. 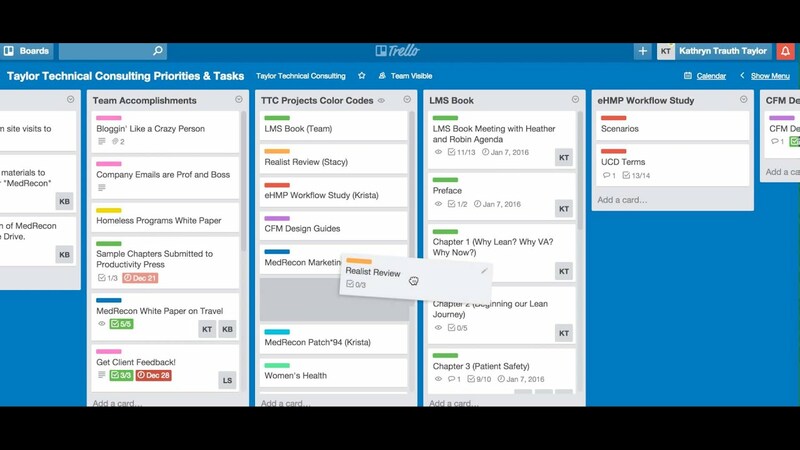 Depending on which project you are working on at any given time you consult Trello to choose what you should be working on next. By processing and reviewing, you can always be sure you are choosing something that is relevant and productive. Review - Once per week you take a longer period of time - maybe an hour - to review everything. This includes consulting your Someday/Maybe list to see if anything is newly relevant or no longer relevant, checking that all the Next Actions are still valid, and just getting a birds eye view of what's on your plate. Below is a quick technology guide to get you up and running with the technology I chose to implement GTD. I've mentioned it a lot and I thoroughly recommend using Trello to store all your various lists. 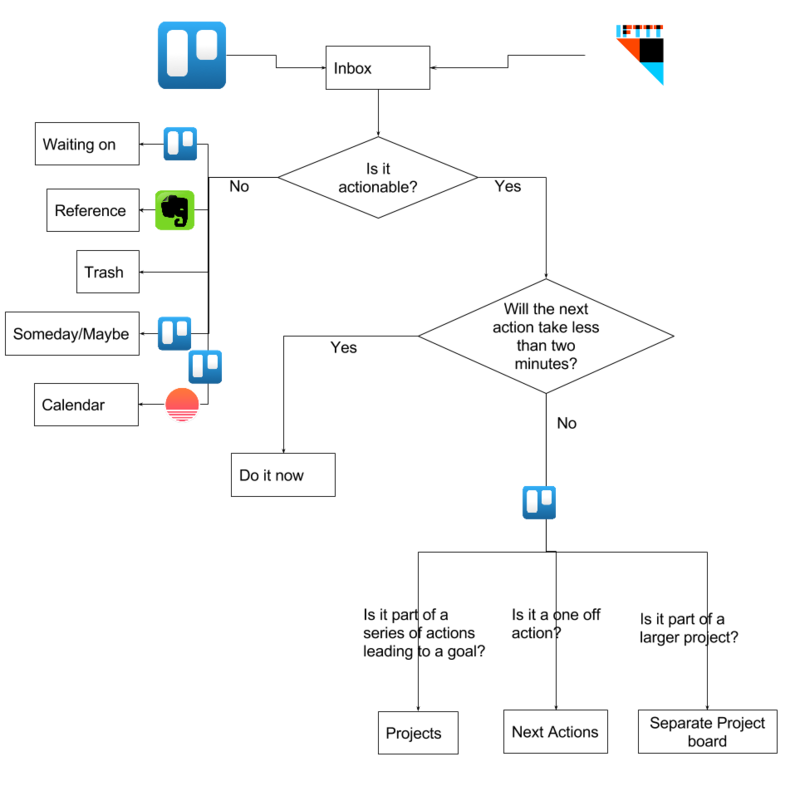 Feel free to implement it using any other organizer of your choice, but if you're interested in getting started with Trello you can check it out here. There are templates below for you to use if you want to copy my method. Evernote is a cloud document storage similar to google drive or dropbox but more accessible and made for capturing content from the web, which is really handy any time you read an article and want to save it for later - and make sure if the site goes down, you still have access. Check it out here. Sunrise is a calendar similar to most, but excels in it's integration with other platforms and it's very pretty UI. You can easily import other calendars so it's a breeze to get started, and automatic integration with trello means that by putting a due date on a card, it shows up on your calendar. This is how I track items in both Trello and on my Calendar. Check out Sunrise here. IFTT, which stands for 'If This Then That', is a handy online service that allows you to schedule actions and trigger actions from events between different apps. I use it with Trello to schedule recurring cards. This means that like clockwork every saturday I get reminded to do my laundry and budget for the week. Get started with IFTT here. So some other handy things if you're interested in Getting Things Done (sorry, couldn't resist). You can't go past the original book which goes into a lot more depth than I could ever cover in this post. You can buy it from Amazon here: Getting Things Done: The Art of Stress-Free Productivity . I've made available templates on Trello so you can copy the setup I have. You can get the GTD Board here and the project board here. If you have any questions or suggestions hit me up in the comments below or at my email, nathanw022@gmail.com.